When installing a shower there's no quicker or better solution than one of our self contained shower cubicles. Quick and easy to put together, from flatpack to finished shower takes two people less than three hours and the cubicles are complete with no extra costs for tiles and labour to put them up. The self-contained units feature white, super shock resistant panels that are easy to clean with no grouting to discolour. The cubicle unit hides the pipework for the water supply eliminating the need to bury it beneath tiles. Contained shower cubicles and shower units do have some advantages over wet room areas and showers over the baths and bathtubs. They contain the heat as the steam builds up inside them, keeping them warm and giving the added benefit from the steam which is good for skin and relaxing tired muscles. There is also a reduced amount of water splashing out onto floors and wall tiles as the shower cubicle will be water tight. For steam, warmth and impact in your bathroom, a dedicated self contained shower cubicle is luxurious and refreshing and worth installing if you start the day with a shower. You can build your very own ultimate shower cubicle by tailoring your selection of the essential elements or buy a ready built, high quality shower that slots into your bathroom with ease. Whatever your choice it will add value to your home and guarantee a good start to every day. 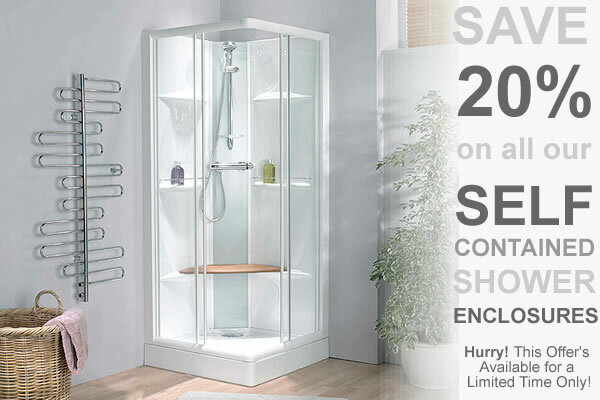 Also see our sophisticated range of contemporary, minimalist design shower cubicles, shower units and wetrooms. The range includes every shower cubicle you could possibly dream of for your bathroom, whether you are looking for a quadrant shower enclosure, a walk-in shower, penthouse, corner entry or jumbo shower cubicle - and if you can't find what your looking for, call us for information on our bespoke shower cubicle service!